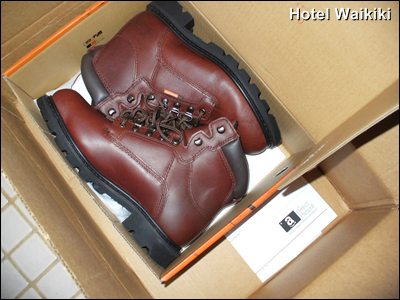 As I was saying in yesterday's post, I arranged for the work boots that I purchased from Amazon to be dropped off at the nearest FedEx holding station. It's easier for me to pick up the package myself than rely on the FedEx delivery person. Steel toe. Water-proof. I'm off to the wedding in London. Are you also watching the royal wedding yourself live on tv? Is there anything else on tv. They pre-empted the late evening news to broadcast the event. From what I've watched so far on tv (10:52 HST), the royal wedding won't disappoint. Talk about pomp and pageantry. Undisputedly, "the British have a well-oiled machine," in that department. And a backdrop of Buckingham Palace and all them regal buildings does hurt. I wasn't even planning to watch the royal wedding after being bombarded non-stop all week long with pre-wedding media blitz, but I'm staying tuned. Good looking! How long going last? Brad- LOL. I ended up watching it to the ending, with barely any commercials. Nate- I usually re-sole twice than by then the inners are worn. Then buy new shoes at Kim Chow's, Fort St. Mall. Those are mighty nice boots! Congratulations! However, the real test is after you've worn them a couple of days. I wasn't going to watch it all either, but I was up at 2:00. Took me a day to recuperate. Kay- these are extra wide. The EE just didn't work out. So, I figure it's guud. I actually stopped at Kapiolani Park and tried them on before getting home. The wedding event was even better after they exchanged vows and rode back to Buckingham Palace....must have been 200 horsemen escorting. And thousands of Beefeaters with their military beaver hats lining the entire route.